Macros let you do this! Want a better way to make "classy" objects? Macros can do that too! 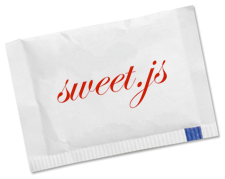 Sweet.js is still a young project so expect bugs and missing features. If you find a bug, please report it on github. This can be read as "define a macro named 'id' that matches a single token surrounded by parenthesis and when invoked returns just the matched token". A pattern name that begin with "$" in the left hand side of the macro definition matches any token and binds it to that name in macro body while everything else matches literally. A pattern name can be restricted to a particular parse class by using $name:class in which case rather than matching only a single token the pattern matches all the tokens matched by the parse class. The commonly used parse classes that have short names are expr (matches an expression), ident (matches an identifier), and lit (matches a literal). The full list is described here. Repeated patterns can be matched with the ... syntax. A repeated pattern with a separator between each item can be matched by adding (,) between ... and the pattern being repeated. Repeated groups of patterns can be matched using $(). Macros can match on multiple cases.